Perhaps you’ve seen us call Wondercide soap – and our pet shampoo bars – “true” soap, but what does that really mean? With endless confusion surrounding liquid body washes, ideal pH levels, and mysterious detergents, it’s enough to make anybody want to skip bathtime! But now you can keep your pets & family clean and your facts straight with the full scoop on Wondercide soap. Soap is made from natural oil, whereas most detergents are made with petroleum. A good deal of liquid body washes and other skin cleaners are really detergents, but since some also have soap-like properties, the lines have become blurred. 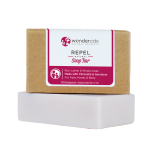 Wondercide makes a complete soap – NOT a detergent wash.
Wondercide soap is in the purest form, mixed in a single run and never milled or broken down. The base of each soap is organic coconut oil, shea butter, palm oil and castor oil, to which therapeutic-grade essential oils are added. Not all essential oils are created equal. Our soaps use only therapeutic-grade essential oils, which means they retain all the qualities of the original plant from which they’re derived. To be considered “Geranium oil,” for instance, an oil only needs to have certain qualities of the plant to be listed as such. Wondercide’s therapeutic-grade, high-quality oils are part of what makes the soap so great, as many low-quality soaps contain the worst quality of oils instead. pH is mainly just an issue if unreacted lye is leftover in bad soap from the saponification process, in which case the soap could be irritating. 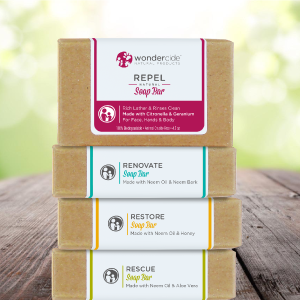 Because Wondercide soap is handcrafted to retain 5% of the original oils and NO lye, pH is not an issue and the soap is totally ideal for cleaning skin on both people and pets. Glycerin and the various oils help to moisturize and retain the skin’s oil mantle, which keeps your skin from over-producing natural oils!